hello, all. it seems that this past month was a blur. 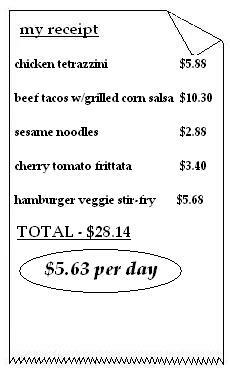 between my 10 year anniversary vacation and my unplanned emergency surgery, i missed posting $30 for 5 meals last month. nonetheless, it is great to be back into the swing of things. with a little chill in the air, we have a great line up this month, as it seems that we are entering fall early. wanna help us out? submit your recipes! creamy chicken tetrazzini– this is a perfect meal to make a lot of and freeze. 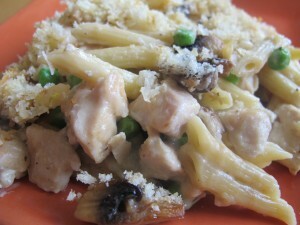 chicken, peas, and mushrooms get smothered in a creamy sauce made with chicken broth and heavy cream. tossed with pasta and other aromatics, everything gets baked in the oven with a crunchy crust made from breadcrumbs and parmesan cheese. the best thing about all of this goodness? it tastes even better the next day. beef tacos with grilled corn salsa– our family absolutely loves tacos! with all the fresh corn available in the summertime, i decided to try topping the tacos with a fresh corn salsa. boy, was it good! 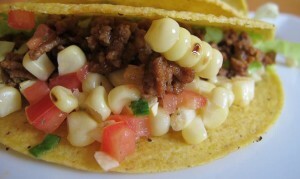 it gave the tacos an extra crunch from the fresh corn and an added sweetness. a perfect pair! 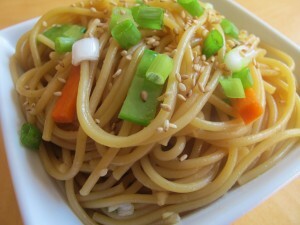 sesame noodles– one of the easiest meals you can make. boil the pasta until al dente. meanwhile, make an incredibly flavorful sauce that consists of soy sauce, sesame oil, brown sugar, garlic and a few other ingredients. toss the hot pasta in that no cook sauce, allowing it to soak up everything. dinner is on the table in minutes. great hot or cold. 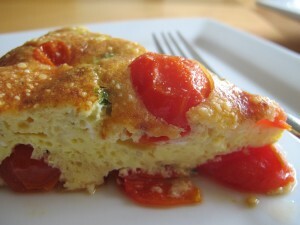 cherry tomato frittata– frittatas are perfect for a quick meal and are very easy to make. this frittata is made with fresh cherry tomatoes and 3 italian cheeses. i even mixed in some philadelphia cooking creme for good measure. perfect for a no meat night…you will not miss it. hamburger meat/veggie stir fry with hoisin gravy– i am always looking for ways to use up leftover veggies in my fridge. 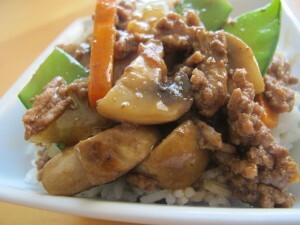 given my hubby LOVES hamburger meat, i tried to create a stir-fry using hamburger meat. this dish was a success! i seared carrots, napa cabbage, snow peas and onions before browning the hamburger meat with fresh garlic. top it all off with a brown sauce made of hoisin and beef stock. perfect over noodles or rice. 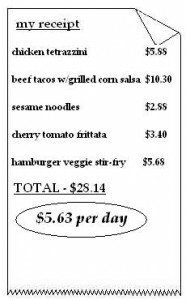 how do these meals tally? check out our receipt! okay, let me know how you liked these meals along with your own unique touches. and don’t forget to send in your great tasting meals! see you next month!